The Manfrotto tripod line for birdwatching and nature brings you the superb construction quality you have come to expect. 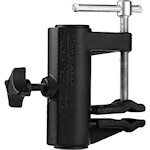 Manfrotto tripods are know for their rapid-action lever leg locks and stability. Formerly known as Bogen, Manfrotto is a name you can trust for high quality. 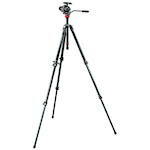 Manfrotto 055CX tripods are full-sized carbon fiber tripods with excellent rigidity. These tripods provide full support for your camera or optic while offering the advantage of minimal weight for their size. 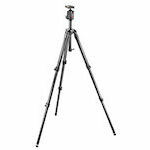 Manfrotto 055CX tripods also offer the advantage of being vibration-dampening. The CXPro models have Q90 center columns that can switch from vertical to horizontal for photographing objects on the ground. 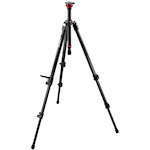 Manfrotto 055X tripods are aluminum tripods with improved leg locks and lighter weight. All tripods in the series have 055XPRO3 legs. There are two kits which include either the -3W 3-way head or the -BHQ2 ball head. The Manfrotto 057 series tripods are professional-grade tripods, designed to offer the best performance of stability and precision. 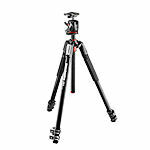 Manfrotto 057 tripods are available with either 3- or 4-section legs; all are made with lightweight, vibration-dampening carbon fiber. Manfrotto 190CX3 tripods are medium height, lightweight carbon fiber tripods with excellent rigidity. 190CX3 tripods are available in 3 models: the basic model with a low-angel adaptor, and the MT190CXPRO3 models which come in 3- or 4-section leg versions. All are made with high-quality, carbon fiber for the best in lightweight and vibration-dampening stability. 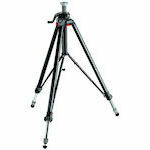 190X tripods are the aluminum versions of Manfrotto's popular lightweight mid-size professional tripods. The 190XB is a basic black tripod without a head. The 190XPROB features Manfrotto's patented horizontal center column adjustment for greater flexibility in framing and set-ups. Some 190X tripods are available packaged with heads. Manfrotto 290 series tripods and monopods are the ideal tools to develop your skill and passion for photography and video. 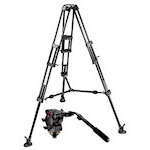 These versatile aluminum tripods come with 3- or 4-section legs, some with QR ball heads and some with video heads. There is one 3-section carbon fiber model in this series. 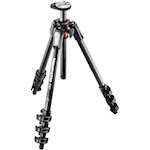 Manfrotto 290 series tripods are an excellent value for the beginning photographer. 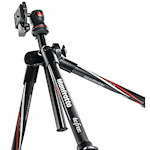 Manfrotto BeFree tripods are compact and light weight with an included ball head. A 4 leg sections that flip up to close around the head allow the BeFree to compact down to 15.7". They are available in carbon fiber and aluminum. The Manfrotto Compact series offers excellent value solutions to effectively hold and support your new photo and video equipment and get the the best out of it. The two models in this tripod series feature a kit with 5-section legs and a QR ball head, and one with a built-in photo/movie head. 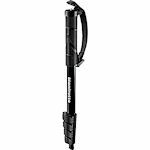 Manfrotto offers a large and diverse line of monopods. Manfrotto monopods come in carbon fiber or aluminum versions, with the option of 3-, 4- or 5-section legs and a variety of head options. Manfrotto monopods are great for those times you don't want to carry a tripod but need support for your video or still camera, or a small spotting scope. Manfrotto Neotec tripods are the fastest-opening tripods ever made. Just pull to extend the legs, push a button and push the feet to close. 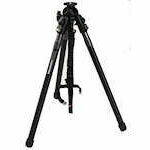 Neotec tripods are full-sized aluminum legs; heads are not included and must be purchased separately. 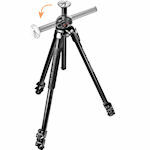 Manfrotto Neotec tripods come with 4 pre-set leg angles that are quick and easily switched between. The Manfrotto 475B Pro Geared Tripod has a center brace strut system, reliable quick-action leg locks, geared center column, and rubber/metal spiked feet. The Pro-geared is an all aluminum tripod leg set (heads must be purchased separately) that provides a durable and ultra-steady platform. 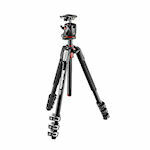 Manfrotto Professional Video tripods are all aluminum tripod leg sets with mid-level spreaders. They are capable of handling heavy weights - some can support up to 35 lbs. The 545B is a two-stage, twin leg design. The 545GB model features a floor-spreader to support loads of up to 55 lbs. Manfrotto specialty supports are a line of tripod and non-tripod supports for photography and nature observations usage. This line comprises a wide variety of products to meet all amateur and professional photographic support needs. 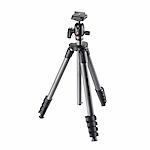 Manfrotto table top tripods are small and portable aluminum table top tripod and kit that fit into any camera bag to give quick support to a lightweight camera or scope. These table top tripods come in three versions: one without a head, one with a 492 ball head, and the 709B digi version with a ball head. 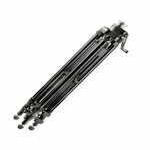 Manfrotto Triaut Tripods include the 3051 (silver) and 3251 (black) tripods, which are great in the studio or on location when you need to support medium or large format still cameras or even digital cameras with large lenses.